I’m glad to hear the words Slack and learning in the same sentence. Because I think with a few adjustments Slack could easily become the best LMS (Learning Manage System) available. Or to put it boldly; the first LMS that would support learning by default. How? Well, we need to look at what research can tell us about student learning. In the book Teaching for Quality Learning at University by John Biggs & Catherine Tang they describe different approaches to teaching and learning. 1) A teacher-centred model of teaching — what the students learn is defined by what the teachers does. 2) A student-centred model of teaching — what the students learn is defined by what the student does. From Teaching for Quality Learning at University — Fourth Edition 2011, part 1, chapter 2. When a teacher talks for three hours about applying a specific theory on a case-study — without any student activity — then the teaching is teacher-centred. The notion is that the teacher can transmit the knowledge to the students. So the better the teacher performs the more the students will learn. On the other hand, when a teacher gives the students the case-study to analyse themselves according to the specific theory it’s a student-centred teaching. Here the teacher gives the students the opportunity to apply the knowledge themselves. The teachers then are there to help the student in their activity. This is where learning happens. This means that the role of the teacher is to enable and support the learning activities that the students perform themselves. So how would a LMS like Moodle or Blackboard hold up against a student-focused approach to learning? Well, if an LMS is about supporting learning it needs to ask the right question; who are suppose to learn and how can the LMS support that? The answer to that question is that it is the students who are supposed to learn and that the LMS needs to support the learning activities that the students perform themselves — in order to support learning. But if you look at a LMS like Moodle or Blackboard they actually support the activities of the teachers (and administration) rather than the activities of the students. Basically, these LMS has a teacher-centred model to teaching. They are designed to help the teachers transmit information and knowledge to the students. And for all credit, they do that well. 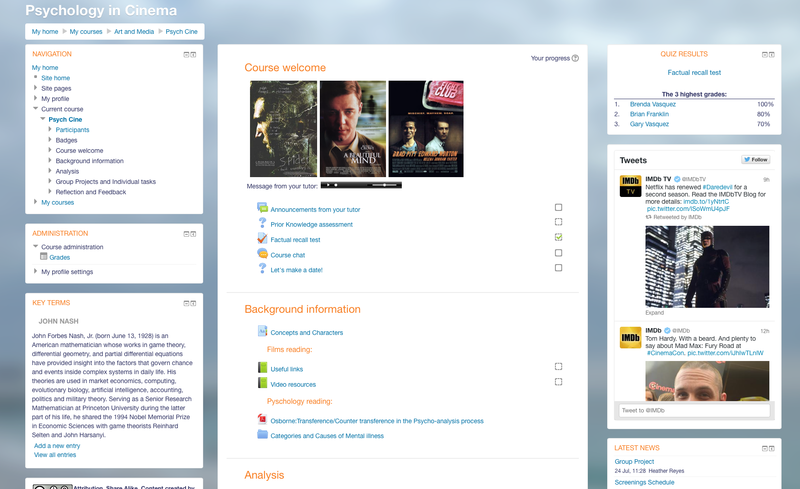 Moodle test course (student view). Lots of information from the teachers. Not much student activity. I will argue that the LMS is by default a transmit-of-information-system — not a student-activity-system. Though you can find elements for activating the students — such as discussion board, wiki, test, surveys etc — they will just always be an add-on. When enabled they can work really great for sure. But if the teachers (or administrations) do not enable these elements you leave out the things that actually help students learn. This means that the students must go elsewhere in order to actively engage in the learning process. And for many students, that place is called Facebook. It’s not a bad thing that they turn to Facebook — not at all. But there is just one problem with Facebook — no teacher. And even though learning is defined by what the students does the teacher is the one who makes the students do the right things. And the teacher knows when the students have learned what they are suppose to learn — and when they haven’t. So where does this leave learning in the LMS? Well, it’s possible and happens a lot. I have seen many great examples of student activities in LMS. But the elements that support student activities will always be an add-on. My argument is that a LMS by default should support the learning activities that the students perform themselves. That should be their primary focus. That’s why I see a great potential in Slack as a new kind of LMS. Would Slack support an active learning environment? Slack is a team chat app that enables great communication and collaboration. What I like about Slack — when thinking about learning — is that it’s by default an active environment. 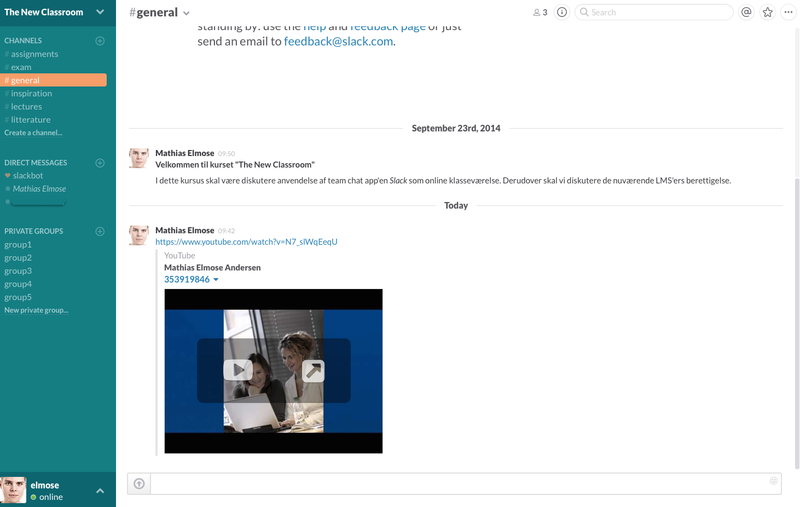 No matter where you are in Slack you can write, post, share, comment and more. Discussions is not an add-on element buried deep within the course — Slack is discussion. It is collaboration. And that’s really what a LMS should be like to support learning. What a Slack Course could look like. Less information for teachers, more space for student activites. With Slack as a LMS the teaching will automatically shift from teacher-centred to a student-centred. Because being active is what you do in Slack — and being active is how students learn. So using Slack will give the students the ability to be active, to discuss and collaborate from the moment they login — under the supervision of a teacher. Adjustments need to be made for Slack to work with hundreds of students and courses for sure. But I will argue that right now you could setup a Slack team, invite your students and have a much better learning environment than any LMS currently out there (well that I know of). Simply by the fact that Slack is an active environment by default. So what you do you teachers and students think? If someone out there would try it (or have tried) I would very much like to hear from you. And Slack — what are you waiting for? Thanks to Jon Morgan and Tim Monreal.